across the hall with shower/tub combo. Walking distance to Superstition Mall, restaurants and grocery stores. I'm a retired gramma, that owns several rental homes. I currently live in Indiana since my husband of 34 years passed away in 2001. I purchased this home as my personal home and flew back and forth for several years before I moved permanently to Indiana to be with family. This is my personal home in Arizona that I'm offering to my Arizona visitors. I haven't been to AZ in several years, but this is a great little home. It's just 1/2 mile from Superstition Springs Mall and all my favorite restaurants. 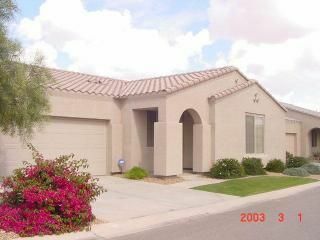 Located in Mesa, Arizona (Power/Baseline) This home is within walking distance to shopping, movie theater, lots of great restaurants, several public golf courses, and Superstition Mountain is only 15 minutes away. Please contact me for the most up to date info. We would stay here again. The location was perfect for us. The home is centrally located to a wide variety of restaurants, movie theater and mall. Great freeway access to get you where you're going fast. Perfect size house 🏡� for us. Great 👍� location and highly attentive owner. I recommend this property. The gated community has a pool and heated spa.